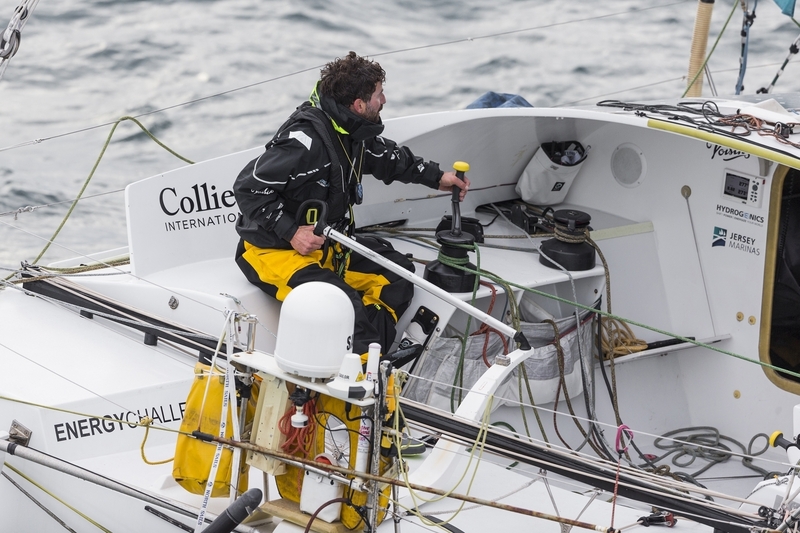 Phil Sharp called in late last night to explain the events of his first day racing in the Route du Rhum. “On Sunday night I hoisted the small spinnaker and within ten minutes the halyard broke. The sail dropped straight into the water, so I stopped the boat and caught it quickly before (I hope) any damage. This halyard is essential for flying our most important foresails in this race – the small and medium spinnaker, so I had to find a solution, and quickly. The only option was to climb the mast, and with the wave height expected to increase significantly for the next few days I had to get the job done. “Then the next problem came. My boat alarm went off – I went inside to find a huge amount of water inside the boat, sloshing around. An access port in the ballast tank blew out, causing 500 liters of water to be released inside the boat. It took a long time to bail out and now I have bonded it back in with Sikaflex, so I am praying that it will hold. “Once this was over it was time to climb the mast. I managed to find an alternative solution for the halyard and thankfully I can now fly my most important downwind sails.